In our model of a city with many small bakeries and many consumers, each bakery is a price-taker in the market for bread. 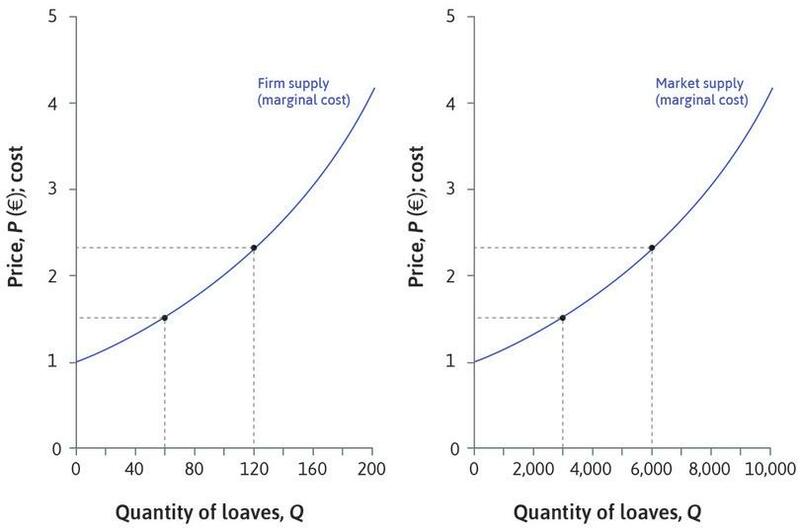 The supply curve of an individual bakery is determined by its marginal cost curve. The market supply at a given price is the total amount of bread that will be supplied by all the bakeries together. This Leibniz explains how to find the firm and market supply curves mathematically. Suppose there are bakeries in the city, and the bakery has a total cost function , where is the quantity of bread that it produces, for . All the bakeries are price-takers. We will first determine the supply functions of the individual bakeries, and then add them together to determine the market supply. , in the left-hand panel. For example, suppose firm has cost function . Then by calculating the marginal cost we find that its inverse supply function is . Rearranging this equation to find in terms of gives us the supply function: . The firm and market supply curves. Figure 1 The firm and market supply curves. The function is the market supply function. The graph of this function, typically drawn with on the vertical axis and on the horizontal, is the market supply curve. Graphically, the process of going from the supply curves of individual firms to that of the whole market can be viewed as aggregation in the horizontal direction; at any particular price, the individual supplies are added up to give the market supply. In Figure 1, we have drawn the market supply in the right-hand panel, on the assumption that there are 50 bakeries () with identical supply functions. So at each price, market supply is 50 times the individual firm supply . As we discussed in the text, the market supply curve can be interpreted as the marginal cost curve for the market as a whole. It gives the minimum price at which sellers are willing to supply a given amount of the good. Since each firm chooses a level of output where price equals marginal cost, each firm that produces a positive amount of output must have the same marginal cost. The market supply curve measures the relationship between total output and the common marginal cost of producing this output. The interpretation of the market supply curve as a marginal cost curve is one reason for the standard practice of drawing supply curves with on the vertical axis. Read more: Section 7.4 of Malcolm Pemberton and Nicholas Rau. 2015. Mathematics for economists: An introductory textbook, 4th ed. Manchester: Manchester University Press.